A bit over two months have passed since the English-speaking world received the new translation of the “Roman Missal Three-Point-O.” Because the missal is intimately connected with Holy Mass, there is literally no end to what could be said about it. Recently, though, I gave an adult education presentation on the topic in my parish. I limited myself to speaking on five central “highlights” and left the rest of the session to questions and answers. I would like to present those same, five central points as a five-part series in this written forum. These observations are not intended to constitute a comprehensive analysis of the missal, but I hope they will serve as insights into the treasures we have just received. The use of the feminine singular pronoun may strike our ears strangely, since we have been referring the Holy Mother Church as “it” for the last forty-some years. The feminine pronoun is, however, a very fitting usage (and one we should employ in our own speech concerning the Church). Why? Because the Church is the Bride of Christ, and She is our Mother. The Bible uses lots of imagery, and one of the most pervasive, overriding images of Scripture is the marriage of Christ with the Church. The image begins in Genesis and extends throughout all the prophets; it is mentioned in the Gospels, and it takes center stage as the wedding feast of the Lamb in the Book of Revelation. Cover-to-cover, the Bible is the story of the marriage between Christ and His Church. Just as in earthly marriage, this heavenly marriage necessitates the union of a man with a woman in an inseparable bond that is faithful, fruitful, and utterly free. For this reason, the Church has always been regarded as a feminine entity. Now our English liturgical prayers reflect that great truth. Blessed Isaac of Stella makes a comparison between Mary and the Church. He points out that both are Mothers. Both, moreover & mysteriously, are virgins—women blessed with generativity, though not with sexual union. 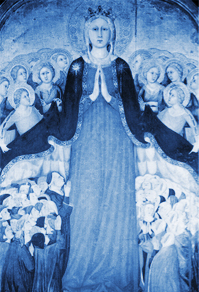 Mary is the Church in nucleo: at Bethlehem, at Nazareth, at Golgotha, at Pentecost, and at the Assumption. Like Mary, the Church is, indeed, our Mother. May She always be honored as such!